With a wide variety of different innovative styles to choose from, Alta Knee Pads allow users to get down to work with comfortable and durable knee protection for the most demanding applications. AltaSOFT Navy AltaLOK Knee Pad (#50703) - Comfortable and lightweight, the knee pad features a contoured mar-resistant capless design. They have the AltaLOK™ Easy On/Off Fastening System and the innovative Alta Strapkeeper System designed to secure excess straps from flapping. AltaPRO Navy AltaLOK (#50903) - Featuring the original AltaLOK™ Easy On/Off Fastening System, the knee pads have a hard plastic cap for easy swiveling and maneuvering on work surfaces. They have a popular navy blue Cordura® nylon cover for added durability, while the innovative Alta Strapkeeper System is designed to secure excess straps from flapping. 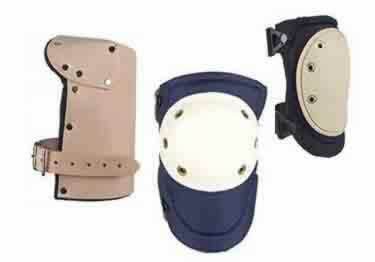 AltaFLEX Nomar AltaLOK Knee Pad (#50423) - Has a soft, flexible light-colored beige cap that is mar resistant, while providing enhanced traction and skid resistance. Knee pads have the AltaLOK™ Easy On/Off Fastening System, black Cordura® nylon cover for added durability, and the innovative Alta Strapkeeper System designed to secure excess straps from flapping. AltaFLEX Hard Cap AltaLOK Knee Pad (#50403) - Featuring the original AltaLOK™ Easy On/Off Fastening System, the knee pads have a hard plastic cap for easy swiveling and maneuvering on work surfaces. They have a black Cordura® nylon cover for added durability, while the innovative Alta Strapkeeper System is designed to secure excess straps from flapping. Choose from Saddle Leather, Cordura Nylon and Ultra Soft Foam Construction. AltaFLEX Universal (ACU) AltaLOK Knee Pad (#50413.15) - Featuring the original AltaLOK™ Easy On/Off Fastening System, the knee pads have a thick durable flexible foliage green cap to protect against rocks and debris. The 1/2" thick compression recovery foam provides firm, consistent support, while the universal (ACU) Cordura® nylon cover provides added durability. The innovative Alta Strapkeeper System is designed to secure excess straps from flapping. Finished brushed tricot liner wicks away moisture. AltaCONTOUR Black AltaLOK (#52913.00) - Biomechanically designed to offer enhanced knee motion and comfort, the pad features a soft black flexible cap providing protection, flexibility, traction and skid resistance. The 1/2" thick compression recovery foam provides firm, consistent support. Pads feature the AltaLOK™ Easy On/Off Fastening System, black Cordura® nylon cover for added durability, and the innovative Alta Strapkeeper System designed to secure excess straps from flapping. AltaCLOUD Knee Pad (#56513.50) - Feature an ultra-soft foam construction and a thick gel memory foam insert. The soft neoprene liner and contoured neoprene strap provide additional comfort, while the durable Cordura® nylon cover cleans up easily and is non-marring. Alta Pro Leather Knee Pad (#30903) - Features a tough saddle leather exterior and a 1/2" thick water-resistant felt padding. Wide leather strap has a plated, rust-resistant metal buckle and is adjustable to most sizes to ensure a comfortable, snug fit.